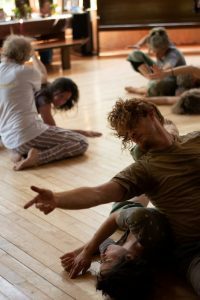 This Contact Improvisation series is an introduction and exploration of key concepts and skills of contact improvisation. Great for movers and dancers who are new to CI, and for regular CI dancers who would like to deepen their range of skill and comfort with contact improvisation. CJ O’Reilly has been teaching CI since 2013. He was introduced to it as a dance major at CU Boulder. He is a passionate teacher and enjoys the puzzle of connecting concept and experience and the excitement of sharing experiences that are new to others. CJ has a rich movement background founded in Martial Arts (Karate, TaeKwonDo, TaiJiQuan, BaGuaZhang), that expanded into improvisational dance and CI, partner dance (East Coast Swing, Fusion, and other dabblings), Ashtanga Yoga and has recieved much influence from afrocuban dance and Capoeira movements.